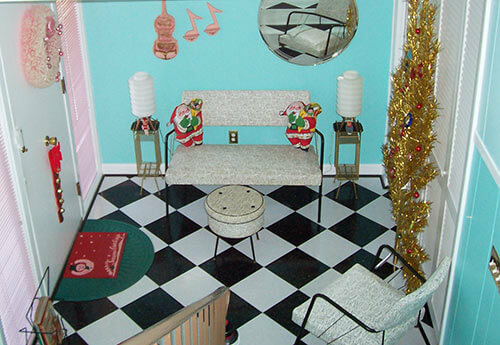 Reader Lori already wowed us with her cheery pink, blue and yellow retro kitchen. 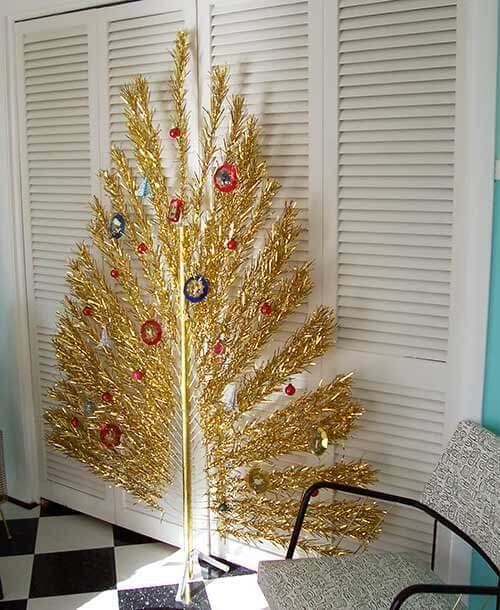 Looks like she’s done it again with her fabulous Christmas woddity — this stunning (and space saving) gold aluminum Evergleam “Peacock” tree — a two-dimensional aluminum Christmas tree meant to be set flat against a wall. Neither Pam nor I have ever seen a retro Christmas tree like this before, and we both think it is absolutely spectacular. Lori has her Peacock tree set up in her rockin’ retro entry way. What a welcome sight this tree must be every time she walks through the door. I saw on your website that you were showcasing some of those fabulous mid century aluminum trees, and I just had to share with you two of my favorites. The first is an EVERGLEAM 7 FT, 51 BRANCH GOLD PEACOCK TREE. I’ve never seen another one like this tree. 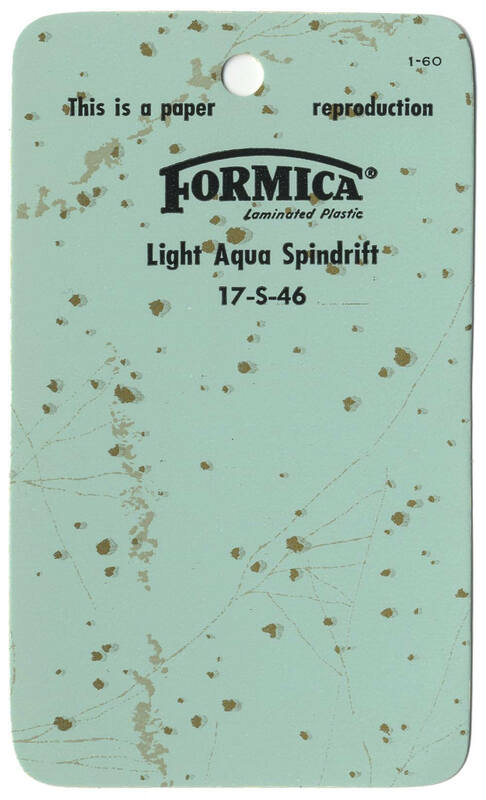 It was made to be used against a flat wall or in a very small space. As you can see by the profile picture it doesn’t look like a tree until you see if from the front view. It came with the original box that was in rough shape, I added pics of it, but unfortunately no instructions or sleeves for the branches. 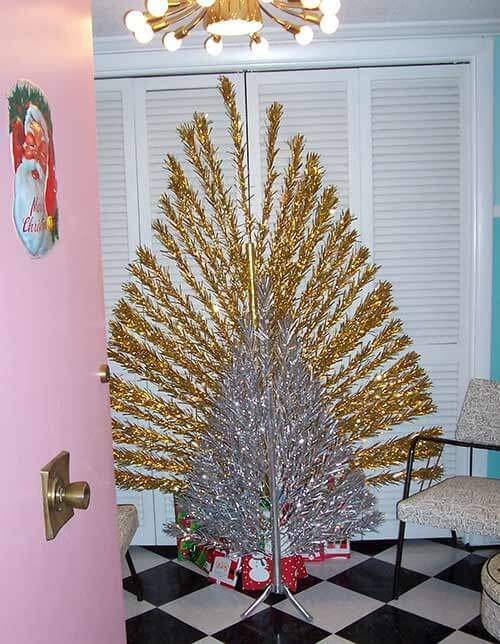 I have researched on the internet and could find nothing about this FANTASTIC so very MINIMALIST MID CENTURY TREE. We display it in our foyer and we get SO MANY comments on it, and most folks tell us we should just leave it up all year round. We won in on Ebay a couple of years ago from a seller out of Wisconsin. If anyone has any info on the tree we’d really appreciate it. Someone wrote on the box 1958 and someone’s name but I don’t know if that’s the original date of the tree or not. 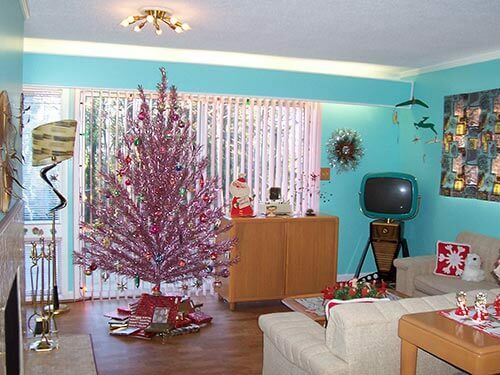 And then I had to attach a picture of my old time favorite Aluminum Tree my 7 FT PINK EVERGLEAM tree. We’ve bought vintage ornaments at garage sales, flea markets and ebay so that all the ornaments we use are vintage as well. I’m always so excited when it comes time to decorate for Christmas so I can display these two beautiful trees. My love for the Aluminum Trees came from my Grandmother. When I was a child she had a Silver Aluminum Tree with a color wheel and I would sit there for hours just watching the color wheel change to all the different colors on the aluminum branches. But unfortunately when she passed away my grandfather accidentally threw it away. So I was determined to get a tree and display it in honor of her every year. Thanks again and I hope you enjoy the pictures of my two favorite HOLIDAY decorations. And to all I wish a very MERRY CHRISTMAS! 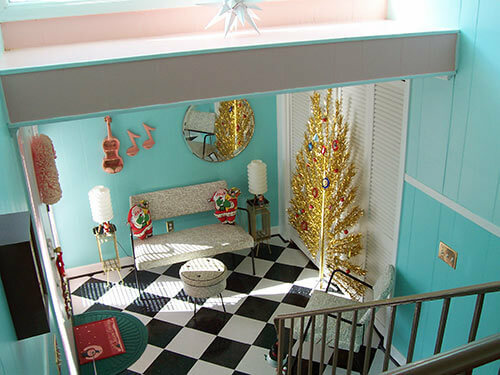 Wow — two stunning and unique vintage aluminum trees living under one roof — it must be a Christmas miracle. 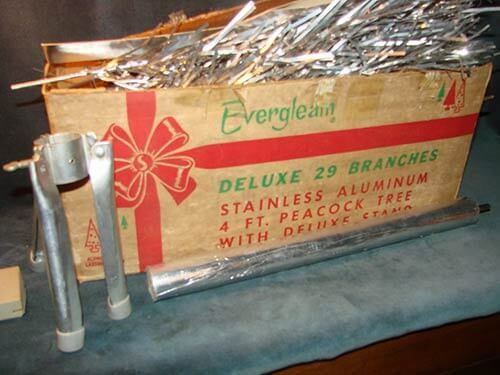 After hunting around the internet for retro aluminum Peacock trees, all that came up was one lonely Ebay listing (that has since sold) for a four-foot, 29-branch silver Evergleam Peacock tree. 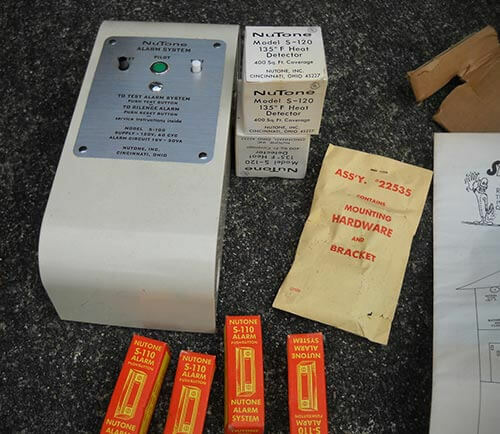 Seller gsa was kind enough to give us permission to use the photos of this smaller scale rarity in our story. 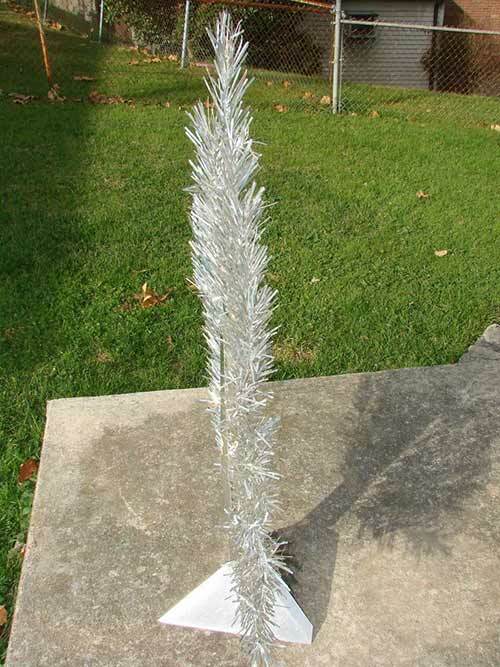 Readers — have you ever owned or seen one of these aluminum peacock trees before? UPDATE: After this story aired, I heard back from reader Lori — owner of the gold peacock tree. Turns out that she bought the small silver peacock tree from Ebay that we featured. 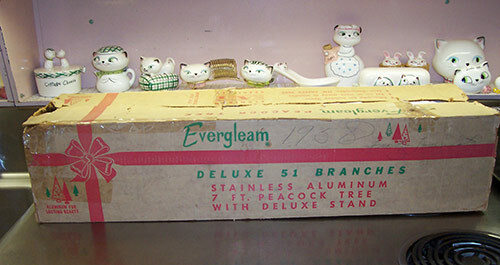 She was kind enough to scan and send the original instructions that were included with her silver tree for the Retro Renovation archives. Lori also sent a photo of the two trees “posing” together. I saw that you featured the smaller 4 foot Peacock tree as well. I am the lucky person to have actually won that tree. After I sent the pics of my Gold Peacock tree I ran across this little tree on EBAY and I was the only one to bid on it. I was really surprised that no one else bid so I got it for $65.00. I just received it in the mail today and I was thrilled to find that the original instructions were inside along with the cardboard tripod and stand cover that came with these trees. Mine didn’t have one and I see that the Gold Peacock tree listed on EBAY currently doesn’t have the tripod or stand cover either. I’d imagaine that they were so fragile I doubt if they stood up over the years. Hi all! 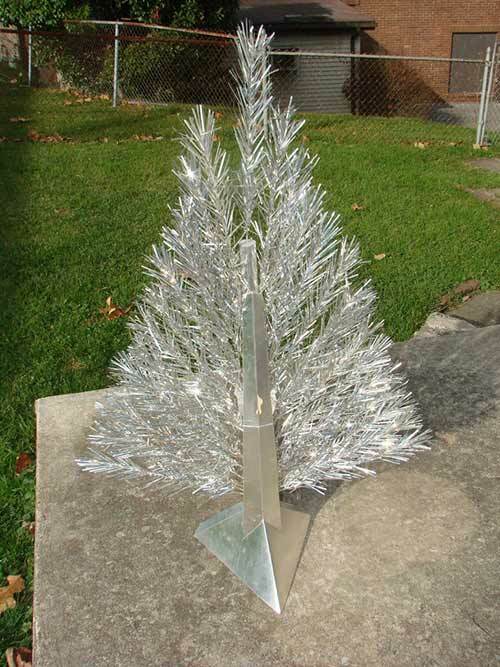 I just wanted to let you know that there is an all new book all about Evergleam aluminum Christmas trees available for pre-order at http://www.evergleambook.com . This is truly an exciting and interesting book and is the first work to come out since the groundbreaking Season’s Gleamings in 2004. 10% off discount is available through Cyber Monday.